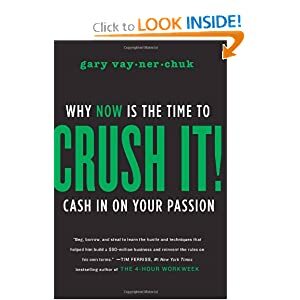 Needless to say, I HIGHLY recommend the book “CRUSH IT!” by: Gary Vaynerchuck. If you end up needing help with any of the methods he talks about in the book, then feel free to contact my office and we’ll see about getting you a coach to help you implement your new business model! An excellent read! This book changed my whole outlook on life/work along with “The 4 Hour Work Week” by Tim Ferriss. I am chasing my dreams everyday because these two men opened up my eyes to follow your dreams.